1. 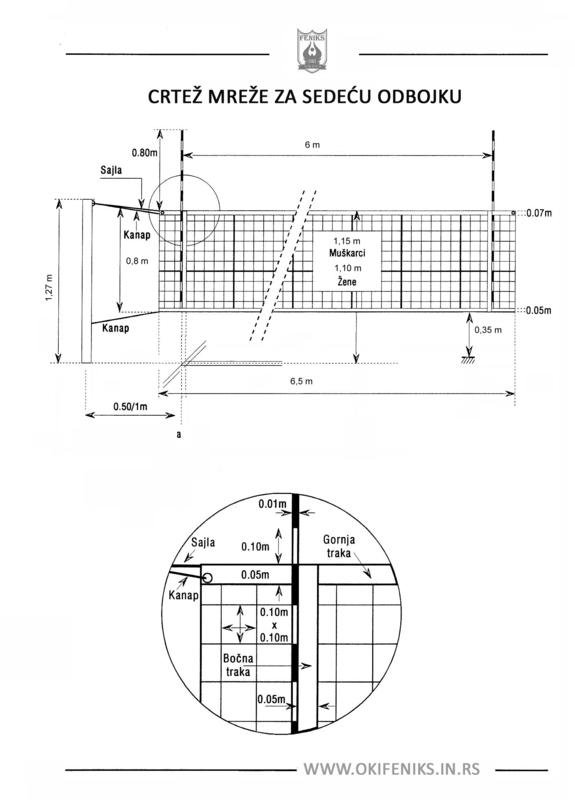 The size of the playing court is 10 m by 6 m.<br> 1A. The size of the playing court is 18 m by 9 m.
2. The attack lines are drawn 2 m from the axis of the centre line. 2A. The attack lines are drawn 3 m from the axis of the centre line. 3. The net is 6.50 to 7.00 m long and 0.80 m wide. 3A. 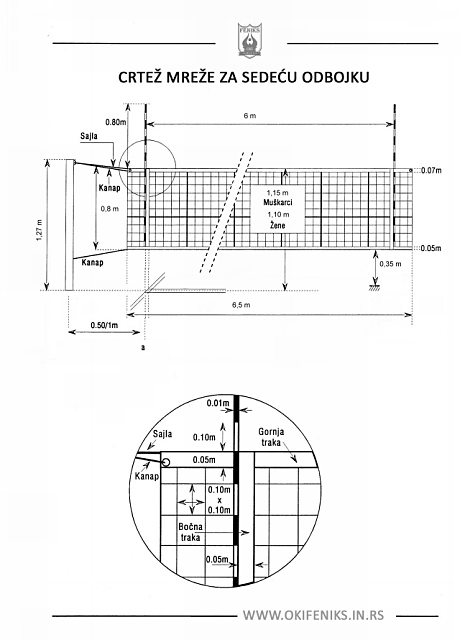 The net is 9.50 to 10.00 m long and 1.00 m wide. 4. The height of the net is 1.15 m for men and 1.05 m for women. 4A. The height of the net is 2.43 m for men and 2.24 m for women. 5. Players equipment in sitting volleyball may include long pants. They are not allowed to sit on thick material. 6. A team may consist of a maximum of 12 players including a maximum of two players classified as minimal disability, one coach, one assistant coach, one trainer and one medical doctor. The six players on court may include a maximum of one minimal disability player. The six players on court must include a minimum of one C class player and may include a maximum of one A class player. 6A. A team may consist of a maximum of 12 players, one coach, one assistant coach, one trainer and one medical doctor. 7. The positions of the players are determined and controlled by the positions of their buttocks. This means that the hand(s) and/or leg(s) of the players may lie in the attack zone (back-row player during an attack hit), in the court (server during the service hit), or in the free zone outside the court (any player during the service hit). 7A. The positions of the players are determined and controlled by the position of their feet contacting the ground. 8. At the moment the server hits the ball, he/she must be in the service zone and his/her buttocks must not touch the court (end line included). 8A. At the moment the server hits the ball or takes off (for jump serve), his/her feet must not touch the court (end line included). After this hit, the server may step or land outside the service zone or inside the court. 9. To touch the opponents court with a foot/feet/leg(s) is permitted at any time during the play, provided that the player does not interfere with an opposing player. The player must return the foot/feet/leg(s) directly to his/her own court. To touch the opponents court with a hand is permitted, provided that some part of the penetrating hand remains either in contact or directly above the centre line. To contact the opponents court with any other part of the body is forbidden. 9A. To touch the opponents court with a hand, foot or feet is permitted, provided that some part of the penetrating hand/foot/feet remains either in contact or directly above the centre line. 10. Front-row players are allowed to complete an attack-hit on the opponents service, when the ball is in the front zone and completely higher than the top of the net. 10A. It is an attack-hit fault to complete an attack-hit on the opponents service, when the ball is in the front zone and entirely above the top of the net. 11. A back-row player may carry out any type of attack-hit from any height, provided that at the time of the hit the players buttocks do not touch or cross over the attack line. 11A. A back-row player may carry out an attack-hit unless: (a) his/her foot contacts or is in front of the attack line at the take-off; and (b) at the moment of the hit the ball is entirely above the top of the net. 12. The front-row players are allowed to block the service of the opponent. 12A. It is a blocking fault to block the opponents service. 13. The player must have contact with the court with the part of the body from the shoulders to the buttocks at all times when playing the ball. To stand up, raise or take steps is forbidden. A short loss of contact with the court is permitted when playing the ball, excluding the service, the block and attack hit when the ball is completely higher than the top of the net. 14. A substitution is illegal if the substitute player is not sitting on the substitution chair so that the classification controller can check the substitute's classification. 14A. In standing volleyball, the substitute player must sit on the substitution chair before the request for substitution. 15. The first referee carries out his/her functions standing on the floor at the post at one end of the net. 15A. The first referee carries out his/her functions seated or standing on a referees stand located at one end of the net. His/her view must be approximately 50 cm above the net. Complete Game Rules of "standing" volleyball can be downloaded from the webpage at FIVB website.